Another of my finds from Falls Creek SNA. This lichen was very noticeable when I first walked into the woods; the earlier rain intensified the color of this and many other lichens and mosses growing on the trees. I didn't see as many of them as I walked on, but I think it might be because they started to blend into the background more as things dried out. the overall shape, texture, color and size matches the pictures in my books. under a dissecting scope I saw numerous grainy-looking warts ("coarsely granular soredia from pustules"). the underside is black with the edges brown. there are a few small, black unbranched rhizines (rooting structures) on the underside. the chemical tests matched, mostly . . .
To make your lichen identification more certain you should use a few chemical spot tests that indicate the presence of various lichen substances. The two simplest and easiest to accomplish at home are the C test, or bleach and the K test, or potassium hydroxide solution, with sodium hydroxide, or lye and drain cleaner being close substitutes. 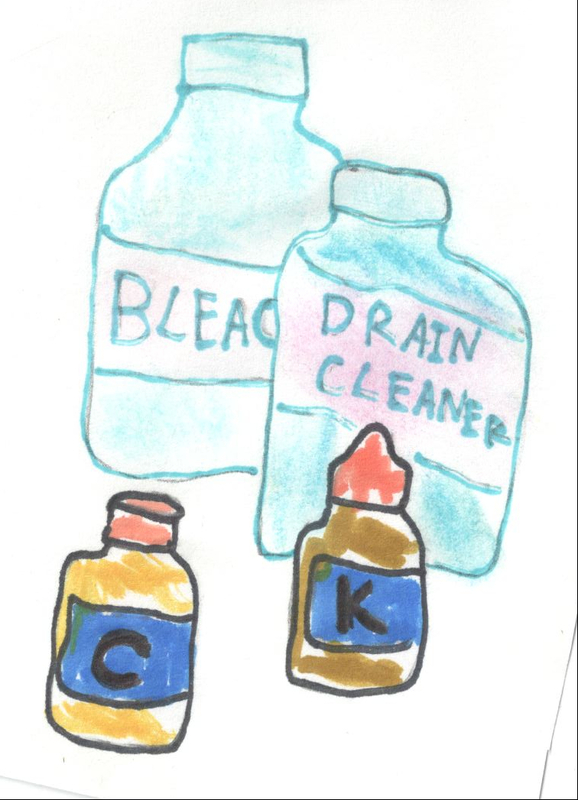 Another test you can easily do at home is the KC test, where you first drop your K solution, let it soak in, and then your C solution. The way these test work is that in the presence of particular lichen substances, certain parts of the lichen will change color. In the case of Flavoparmelia caperata, the C and K test produce no color changes, which is what I saw. The KC test produces a gold stain on the outside of the lichen (the cortex), and pink stain on the inside (the medulla). I didn't see this, I saw a really bright green on the cortex, and a orangish, brownish, maybe pink color on the medulla. So I could be wrong (I'm definitely still learning), or maybe because I'm not using potassium hydroxide for the K test. Whatever the results, it's an enjoyable process. You might wonder why I find it enjoyable, it seems like an odd pastime I suppose (though if you're reading this blog you can probably see how). For me it's like doing a puzzle and it's the joy of learning. And there is the occasional insight or new perspective on the world; another small piece of the puzzle falls into place making the picture clearer.